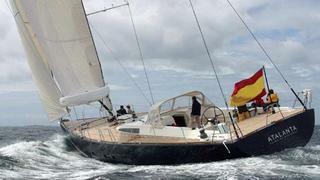 Jim Acher at Ocean Independence sends word of a 20% price drop on his central listing, the 25.13m sailing yacht Atalanta, by an owner who wants her sold now and is very open to offers. She was built by France's JFA yard in 2002 and is a proven transatlantic voyager. Atalanta was extensively refurbished in 2005/2006 and is now in turnkey condition. Legally available for charter in Spain, this superyacht accommodates up to eight guests in a master, two twins and two Pullman berths. Additional inducements for a potential buyer include the facts that she's just had a new set of sails delivered, her Spanish Matriculation tax is paid and Atalanta already has 43 days of charter booked in 2011. Available to view in Palma de Mallorca, her price is now down from €1.7 million to €1.375 million.